I love how language propagates today, how fast a phrase can be pushed all around the world. But, would love to see fresh thinking of embracing this, for good. Here’s one from me, GiveDirectly. Unconditional cash donations to those in extreme poverty. $0.91 of every dollar ends up in the hands of the poor. They even, are running a basic income study, heck you can even create your own. The best projects are lightweight. How can we do this with less? If we had no money how would we do it? Could it be done in an afternoon? What feedback do we want? Could we draw this? Or emulate by building with cardboard? How many/much of do we realistically need? What will get us by? OR what is pertinent? ^ Is it really pertinent? Could you get away without it? Does everyone understand WHY and WHAT we’re creating? What is the specific outcome or impression we want to leave? What CAN we be precious about? What can we forgive? Do we need this many people involved? What steps CAN we remove? What is this analogous too? What is a similar system, or process? I’ve talked about the open web and how it’s changing, apps and private platforms like YouTube, Facebook, SnapChat have all expanded what you would now call the web in 2017. And this vastness is hard to capture all in one place, Facebook has an idea of how vast and deep it is but no one else does. The same goes for YouTube. In tandem, apps like Slack, are they part of the web? Arguably so. Email, email is content? Smart tv apps? Voice assistants? The list goes on. My point is, that the internet now is very deep and a lot bigger than any of us can ever imagine, all around this premise of connected information. And with that, there are more opportunities than ever before to learn, to create, to share, to build a business, to seek out your own corner of the internet. Amazon recently announced their Whole Foods acquisition. Mr Bezos is basically finding more and more products in your life, that he can wrap with Amazon Prime at the middle. Once you’re a member you’re in the club. A club where you are the star. If you’re in, you’re in – if you’re not you’re missing out big time. One by one they’re chipping away, they’re probably only a few products away but once they hit that sweet spot I think they’ll face another big growth curve. Why give Amazon a small share of your wallet when they could be making your life easier with a larger share? It’ll be phone, internet, content, products, consumables… what’s next – houses? Something to think about. Amazon is fast becoming the Walmart of modern day. I suspect there’s a future intersection between Amazon Prime & UBI. In New York a line outside a restaurant/shop means something is good, it must be, otherwise why would people be lining up? If we unpack that a little bit too – my expectation of a line in New York is that it will move fast. Even a line out the door can clear in 10 minutes. However, in New Zealand, a line means slow service or they’re understaffed. A line the same length you could be in for 30 minutes. So if there’s a line you tend to flag something. It’s always funny when someone visits or I return to NZ, to flip it, oh a line is bad now. I suspect elsewhere in the world, a line means something else too. It’s long been a platform I personally haven’t played with too much. Yet, YouTube continues to grow in dominance, people are creating whole businesses and lifestyles on there. Sure, I dabbled in the early days. But I’m actively looking for and keen to see anything interesting you’ve seen on YouTube, whether it’s a neat business model, a great channel, inspiration. Just whatever you find is interesting. I’ve long been a user of FancyHands, a virtual assistant service. You fire them a task, they tackle it. You can even text them a request. The way I think about it is, adding an extra 20-60 minutes to my day. So I get them to tackle things like; booking tables, finding me flight combinations, doing research on potential customers, finding a cafe for a meeting, proof reading documents. It’s really up to you. All little things that yes I could easily do, but they either let me tackle something else or stay focused. Now, voice assistants are going to take this same concept and apply it to the masses. Apps are going to be built around these functions. It’s a massive opportunity and a big step up. The reason it’s a reality today, is the connective tissue of the internet through APIs is so robust. Launching them 10 years ago wouldn’t have been helpful, but now at this point in time is perfect. We talk about voice assistants at home – but really, how about them at work? Potentially massive. Ideas don’t mean anything if they’re not shipped. The universe doesn’t care about excuses as to why you didn’t ship it. The universe doesn’t care if House of Cards was on. It doesn’t really care about any excuse that you may have. But the universe does care if you ship your idea and share it. An idea must be shipped; it may not be polished, but if it is not shipped, then the world will not benefit from your idea. And often, we need to ship in order to really understand the original intent behind the idea, to see how it is interpreted, to uncover any unintended consequences, and to see what the world view is like once the idea becomes a reality. I really liked the discussion Kevin Kelly had, where he talked about the future of AI. He said that we won’t be in the world thinking ‘this is AI and this is AI’, rather AI will surface around ideas and products. Some present examples that have already emerged are Amazon’s Alexa and weather applications. That is the purpose of names and brands: to help us to understand what something is or what does; but until we ship, it doesn’t have a name, it is just a concept. As humans, we are unhappy when we don’t create. I had the pleasure of meeting Michael Gerber a while back. I asked him what the secret is to successfully running a business. He answered that people get upset, fatigued, and stressed when they are not creating. When we are merely managing things or “spinning plates,” we don’t get that feeling of accomplishment. That is why shipping is so important, because we’ve brought something new. It’s what we are good at: creating things, things that go on to change the world around us for the better. We have too many bosses. I really like this point. We as a society currently have 40% more “bosses” than we used to have. More bosses who are managing things. Bossing, rather than creating. We don’t need more bosses, we need less, and we also need more freedom. The tools for creation are more accessible and greater in quantity than ever before. Each year, the tools available to us become more and more sophisticated. Want to create a home delivery business from your kitchen table? Use the Uber API. Want to instantly reach millions of people? You can do that from anywhere in the world by using Facebook, Google, Twitter… the list goes on. The power of the tools that we have at our finger tips is greater than ever before. Heck, I recently met a 9-year-old named Cole who had already submitted multiple… MULTIPLE… applications to the App Store. Cole gets it. There is a valley of death. There is a deep valley of death in the center of shipping big ideas. I have seen it discussed in “Crossing the Chasm”, “Self Reliance”, and “Quit” by author Seth Godin. If you find that you are not seeing your projects through to the extent that you should, you may want to give these books a read. Clear everything off of your schedule and solely focus on shipping the idea. Stay up late, get up early, turn off your phone and the internet, put music on. I find that even 3 hours of solid attention is enough to get an idea back on track to be shipped. Remove or kill off components of the idea that are proving onerous. Try to solve a simpler version of the problem. As creators, we tend to over-complicate. Therefore, this is actually a constructive part of the process: shipping a slimmed down version of the product. If something isn’t moving because of YOU, and it is something that someone else can do, have them do it. It may only by temporary, it may be permanent, but see above: until the idea ships, it doesn’t mean anything. In everything that you do as a leader, you lead by example. In order to instill shipping as a culture, you need to do a few things. People fear that an unpolished idea may reflect badly on them and hurt their career. Implicitly give permission by shipping a few unpolished ideas yourself. Kill the ideas that you shipped that didn’t work, and be open about it. This is not about ego, it is about getting out of the way so that the idea can come into the world. Be open to fresh ideas and allow you team to nurture and ship them. Let the unintended consequences, and resulting learning opportunities, come to pass. All shipped ideas must have a clear purpose. If I’m trying to solve X through Y, sharing the purpose allows for other ideas to come to the table and also ensures that those ideas are directionally in align with what your company is trying to achieve. Keep it as part of KPIs, part of the operating DNA of the company. Set aside time for brainstorming new ideas and the resources available for shipping those ideas. Your aim here is to make this habitual, so it becomes a way of life within your company. Shipping ideas should be ‘just how things are done’. And finally, embrace the fact that you are always wrong. In business, our aim is to be less wrong tomorrow than we are today. Ideas that didn’t worked a year ago may work now. It’s only by shipping ideas that we move forward. Listen to these (scroll to the bottom). You can see the real effect of how machine learning can round out the corners on a product or service. 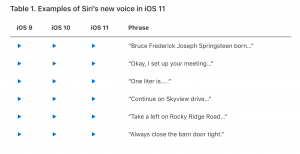 Apple used it to remove the robotic effect Siri has and bring emotion in. It’s something -> that without machine learning, was just simply put going to require too much effort (otherwise they would have done it already). When you listen to the audio, imagine this metaphor applied to any software experience. It literally is just leaps and bounds ahead. There’s been a lot of chatter around the death of the open web. Around the growth of platforms. I’ve also been part of that chat. What’s emerging, is a layer of closed apps, where we consume the internet. But the undercurrent, is that they are all connecting, being built on top of each other. APIs are connecting multiple tech stacks. The web or mesh as we see it still persists. It’s not that the open web is dying its that it is changing – and right now we are in the middle of that change from HTML static files to a fully programmable and algorithmically driven web. As users, we pick the algorithms we want through our selection of apps that we want to consume. At a basic level, If This Then That is an example, it’s taking each of our existing apps and helping connect them. What’s missing though? An open standard for the rendering and handshakes between different apps. All this chatter around Facebook viewability (seeing if an ad is seen by real eyeballs or not), it’s a challenge as there isn’t a standard for the container for which viewability is going to be loaded in to. There is a standard for how viewability is measured. What’s the outtake? It’s an amazing time to be in the market as it evolves – but my take is the web remains open it just doesn’t feel like it. Yet. One thing we’ve (at Nudge) been toying with and discussing for the last two years is – what’s the best play for machine learning for marketers? There’s a lot of hype. And of course, being in the marketing world, only amplified this. Our lens has been, how does it make you super human? What can it do, practically, today, that makes you better at your job? Till we found that, we weren’t gonna touch it. But now I’m excited to share, we’ve got the beginnings of it. The team built a CommonSenseBot, which scans brands content, to find what is or isn’t working. Then lets you know. We flipped the switch on it and just had it running in parallel. Within a few days it caught a major problem on a campaign, which had it not been identified could have cost the client a lot of money. More money than they pay us! (Yes we need to charge more ha). Each week we are adding new components as we operationalize our knowledge and experience into it. As we expand, we’re able to tap machine learning to identify potential problems and wins FASTER through predictions, thus minimizing that time to respond. To me this passes our test, it’s smart, it’s consumable, it makes your better at your job – and it doesn’t add anything more to your plate. i.e. it does make you superhuman! The future of this space is not AI as a sector, it’s of smart products which use it to simply enhance and do a better job. Part of our product inspiration has been Marsbot, a subproduct of FourSquare, which makes recommendations based on where you’ve checked in before, passively in the background. If you haven’t tried it, do check it out.